From my family to you and yours, I wish you a wonderful festive season filled with joy, peace and love. I also want to thank you for reading my blog posts this year, for your lovely comments, and great conversation. I send you best wishes for 2018. I am taking a break from blogging over the festive period because I will be so busy with family time. I want, therefore, to take this opportunity to thank you for reading my blog this year. From my family to yours, I wish you all a joyous and peace filled holiday season and best wishes for 2017. 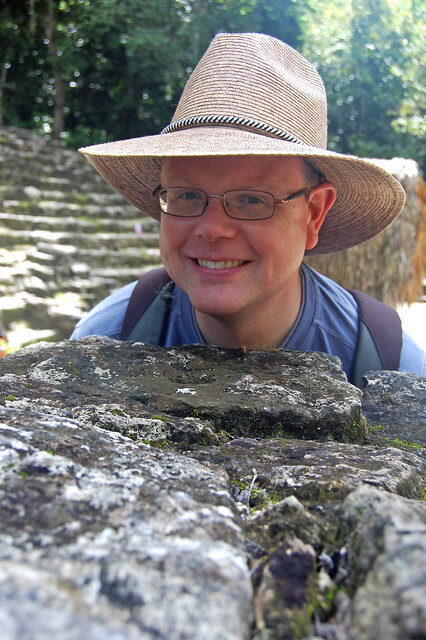 Another day; another Mayan archaeological site. This time – for the last full day of our vacation – we did not drive too far from Cancun, just a little down the coast to Tulum. While Chichen Itza had impressed for its scale and Coba was fantastic because of its position in the jungle, the thing that made Tulum special was its siting on the rugged cliffs of the Mayan Riviera and above the second longest coral reef in the world. 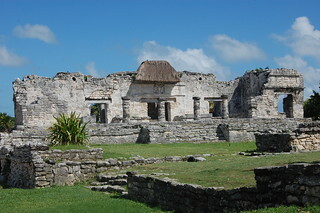 Unlike the sprawl of the other two ancient cities, Tulum was confined within a fortified outer wall. That made it must easier to wander around in the blazing heat but also meant that we were a bit sardine-like with all the coach loads of other visitors. 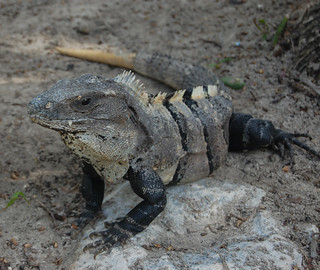 What Tulum had that was entirely lacking at Coba was plentiful information boards so that we could interpret what we were seeing. There was a palace in centre of the site and it was surrounded by other buildings. 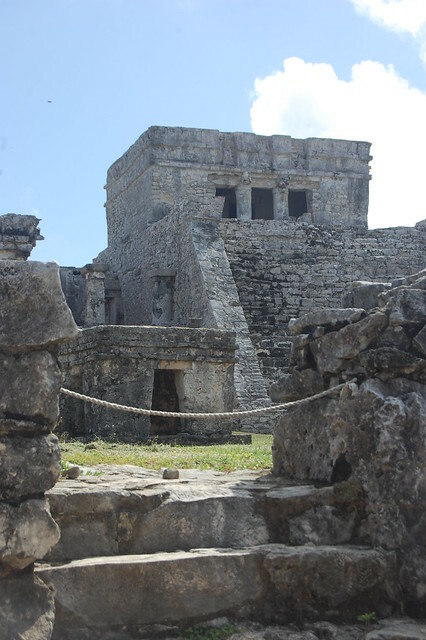 Finally we were given the explanation that the flat platforms in evidence at Tulum and which we had seen elsewhere were the foundation for buildings made from perishable materials. 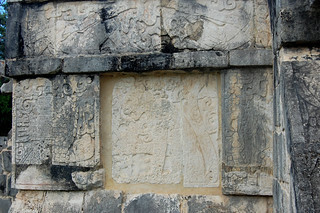 A few of the buildings had carvings of a descending god on them. I rather liked his bizarre upside down nature. 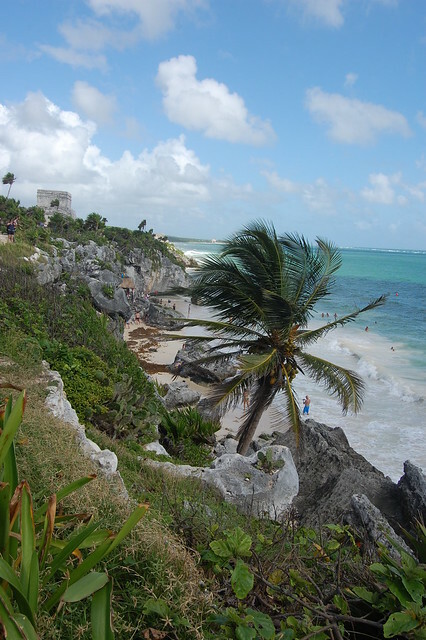 On the promontory, we read about the first contact between the Mayans and the Spanish who, from their ship, thought Tulum looked a lot like Seville. I could not help but wonder what the Mayans, watching the ship from the cliffs, thought of the European interlopers. I liked it up on the cliffs because of the cooling sea breeze. 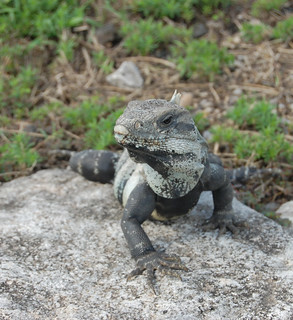 I stopped there to take lots of lizard portraits. 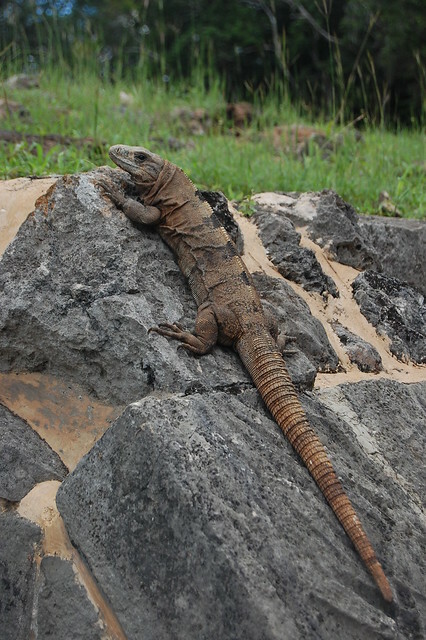 There were lots of iguanas around, wandering with their wide slung cowboy legs. They were not skittish at all and some even seemed to be posing for my camera but they certainly didn’t want me touching them. I tried though. We were disappointed by the actual town of Tulum. We had high expectations as people had told us that we would love it. I expected quaint, picturesque streets, interesting architecture, perhaps whitewashed buildings or houses painted in vivid colours. What we found was just a street of shops selling the same souvenirs and crafts that we had seen all over the place. There looked to be some intriguing eateries but we were not remotely hungry having had another of our breakfast feasts at the hotel. The roads running adjacent and parallel to this main road were back to being ramshackle and run down, not much worth exploring, so we headed down the road to the coastline. We found ourselves on a narrow road lined with cabanas ranging from “hippy” retreats offering sweat lodges, yoga and reiki healing to very swish and swanky looking boutique hotels. The buildings all blocked any view of the shore line and prevented access to the beach but we had to forge on to its end in order to turn around. We journeyed back back to hotel to swim. I did lots of relaxing floating around again. We finished with a dip in the large jacuzzi again as it was getting chilly and we could warm up that way. I sat beside a jet so as to get the benefit of the lobster pot hot water. The jets were so powerful that they kept pushing me off the seat ledge and I had visions of floating into the centre like a star fish stuck in a spin cycle. Thankfully my vision was not realised. We dined in the Argentinian restaurant again. This time I had caprese salad followed by a dish of chicken coated in some sort of piquant salsa and Mr Pict had a wedge salad followed by another steak. The following morning at breakfast, the final day of our trip, I kept finding the waiter was taking my buffet plate from me and taking it to the table. 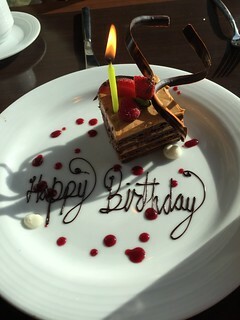 I thought it was because I was right under his nose at the waiter station but they had a surprise in store for me: I was presented with a cake complete with a candle and happy birthday written in chocolate on the plate. It was a very sweet and thoughtful gesture and, as Mr Pict and I ate chocolate cake for breakfast, it felt like a fitting conclusion to our vacation. 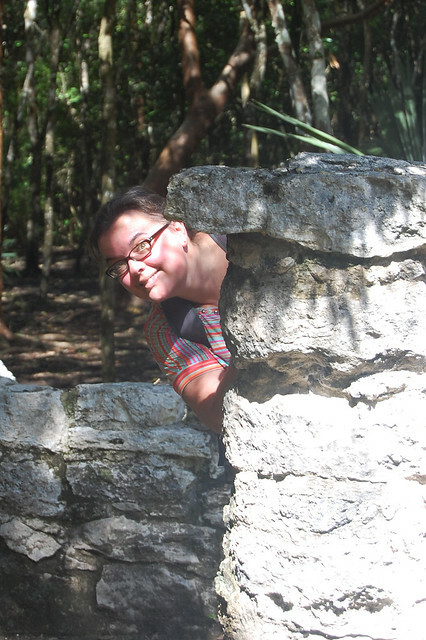 Our next excursion was to Coba, a Mayan settlement shrouded in dense jungle. 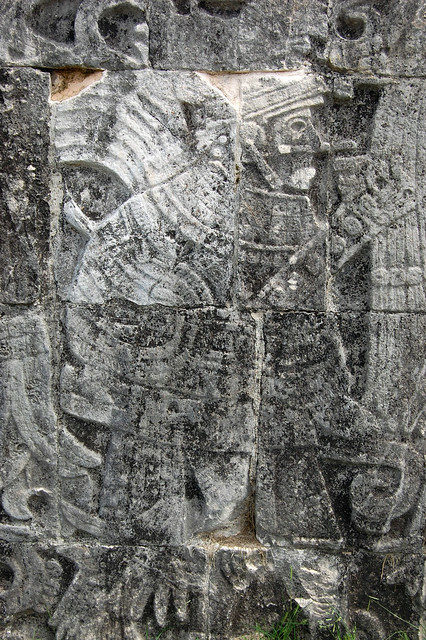 Coba is much older than Chichen Itza, dating from around 50 BC. The drive there was entirely uneventful. It was busy around Playa del Carmen but by the time we turned away from the coast and towards the interior there were hardly any other cars on the road. We noticed wooden platforms lining the side of the road at points. These were where people put their bin bags, presumably to keep them up above ground level and away from scavenging animals. 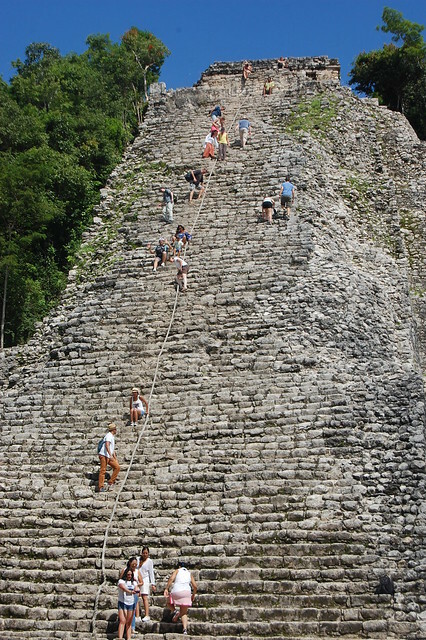 Coba was totally different from Chichen Itza. I could tell that even from the restrooms: I was handed three squares of toilet roll as I entered and there were no seats on the toilets. I was then handed one paper towel after washing my hands. 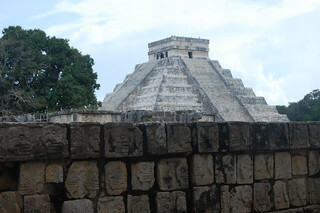 The facilities were very basic but the entry tickets also cost a fraction of what they did at Chichen Itza. 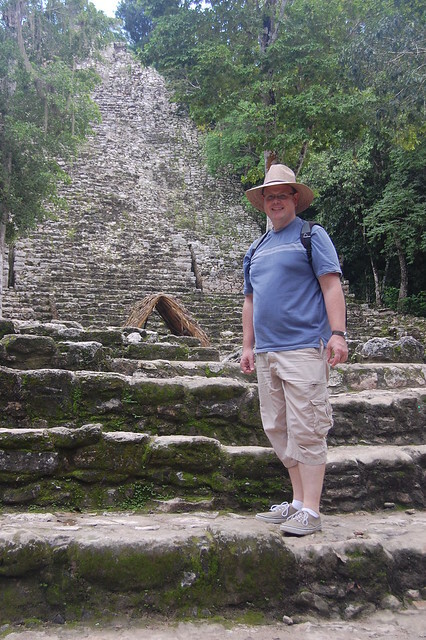 Also unlike Chichen Itza, there was no clearing around the ruins; the jungle was right on top of everything. Our excursion became a walk through the jungle that occasionally led us to some ruins. We really enjoyed it for just that reason. We encountered frogs, lizards, grackle, a hummingbird, lots of ants, mosquitoes, yellow butterflies, and huge blue butterflies. It was very humid and steamy. As we walked 4 square kilometres to see ruins scattered all over the place, my Scottish head became a glowing beacon. 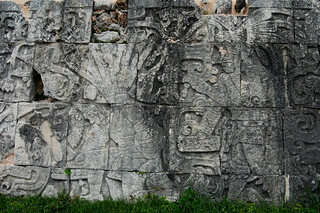 It was evident that Coba was not as protected as Chichen Itza. We could climb on the ruins up to certain height when they got roped off probably more out of concern for the safety of visitors than for the preservation of the ruins. Mr Pict was even brave enough to climb the great pyramid. He found the ascent and descent quite nerve-wracking but decided it was worth it for the fabulous views over the surrounding jungle. I didn’t want to make a spectacle of myself having a panic attack so I spectated from the “weenie creche” benches below. 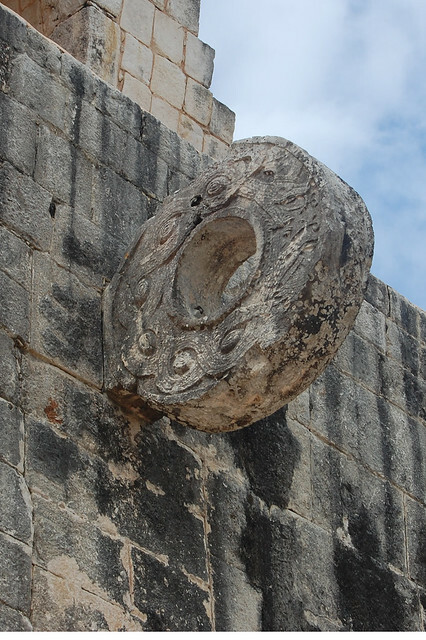 There were two ball courts at Coba and they had much lower rings than at Chichen Itza but I still had no idea how players scored goals off their hips. We felt like a pair of hog roasts when we emerged from the jungle so we decided to go back to our hotel and make use of the facilities. We quickly got into our swimsuits and headed down to the seaside pool. Mr Pict went swimming in the ocean first, diving around in the large waves and strong current, and then we headed into the pool. The water was a lovely temperature. I spent most of my time swimming lazy circles on my back, staring at the clouds, birds overhead looking like pterodactyls, watching the sky melt from blue into pink, the early evening sun slipping below the building line, ears underwater to enjoy the quiet. It was the most peaceful and restful I have felt in a very long time. I also got to experience my first wet bar as we sipped margaritas as we sat in the water. That was definitely luxurious and a big birthday treat. We ended our swimming trip with a dip in the toasty warm jacuzzi as the waves crashed on the shore behind us. Feeling lazy again and drawn to the thriftiness of a substantial discount, we dined in a hotel restaurant again. This time it was an Argentinian Steakhouse, not a promising prospect for someone who doesn’t eat red meat. However, I wound up so stuffed I couldn’t finish my entree which was a wild mushroom risotto. Mr Pict had a steak that was so perfect he could slice through it like butter. The waiting staff were so vigilant and on the ball that I ended up feeling super lazy since I never once had to even pour my own water. I was actually a little uncomfortable with the degree to which I was being waited upon, as if I had servants. I was definitely being spoiled rotten on my big birthday trip. 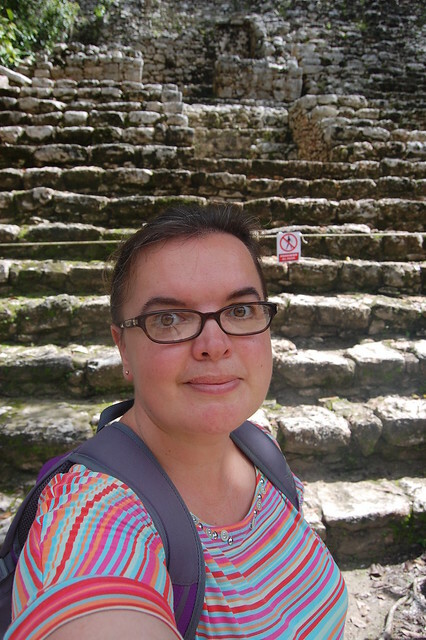 On our return journey from Chichen Itza to Cancun, we decided to go via Valladolid. The drive did not take too long and took us through a few small towns. We noted that each village had a little police building at each end, almost like a border control – though several of the police officers we passed were looking at their smartphones. The housing was very basic in that area, the dwellings little more than shacks, the windows having wooden sticks for slats rather than glass. There were also lots of feral dogs and lots of those peculiar bicycles with the baskets. We also drove past a prison where a stall outside was selling brightly colored hammocks made by the prisoners. It felt peculiar and not all that comfortable visiting an area with such obvious poverty from a base at a luxury hotel. 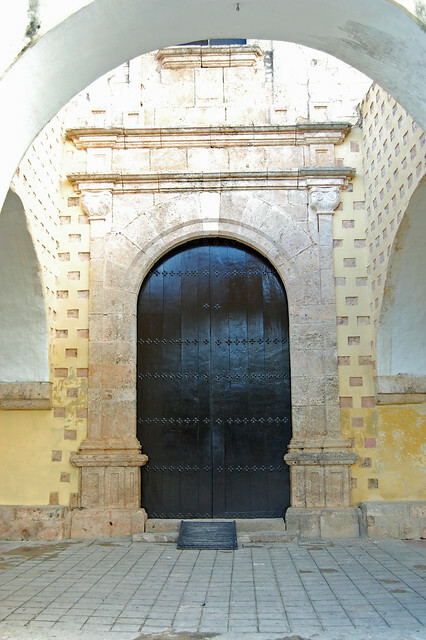 I wanted to visit the former convent and current church of San Bernardino de Siena. The guide book and Google both indicated that the church would be closed to visitors by the time we reached there so Mr Pict parked up and I got out of the car to walk the perimeter of the building and take photos. As I wandered, however, I spotted that it was actually open so Mr Pict joined me and we took ourselves on a self-guided tour. 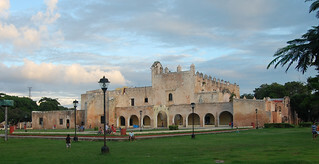 Valladolid was founded as a colonial town in 1543 by the nephew of the famous Conquistador, Francisco de Montejo. 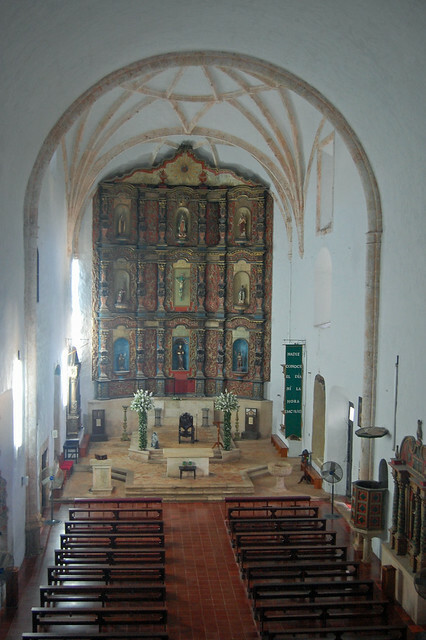 The church was built soon afterwards, in the 1550s making it one of the oldest churches in the Yucatan peninsula, maybe even the oldest. The exterior facade was unassuming veering towards ugly. Its surface reminded me of a wall when the tiles have been ripped off but some of the adhesive remains. The interior was very simple and worn in places, suggesting that perhaps it has not been updated architecturally much since it first opened its doors. The cloister’s arches were even covered with moss and algae. It was a very interesting place because of that, however. The walls reverberated with its centuries of history. The actual church contained some fascinating ecclesiastical artwork. There were some sculptures that I found a bit creepy, I must admit, as they looked like dead-eyed dolls. There was also a Christ who looked like a marionette. There were some frescoes on either side of the alter, the colours still surprisingly rich against the plaster. The proportions of the figures gave me a wee bit of a chuckle as the cherubim had skew wiff bum cracks. Peurile humour, I know. 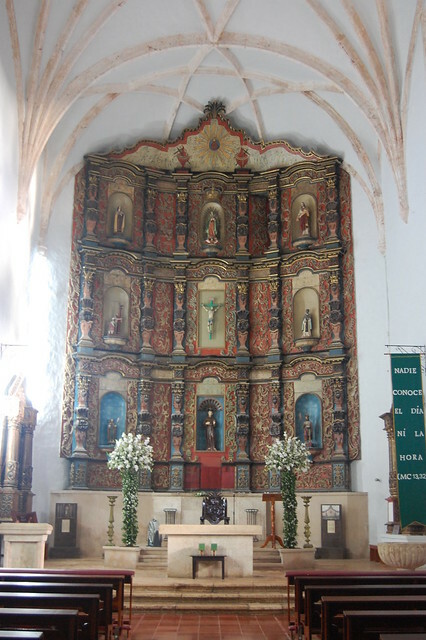 The most dominant feature of the church, however, was the imposing altarpiece. Carved out of wood, it contained niches for various biblical figures. On an artistic level, it was not my taste but I certainly found it interesting to look at. The upper level of the building was full of corridors leading off into little rooms. 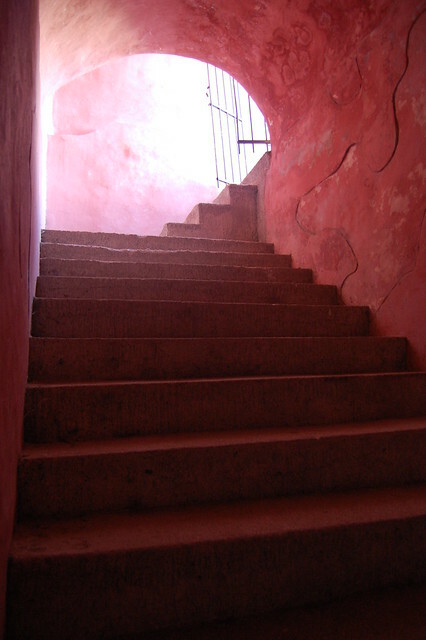 The walls were a lovely shade of candy pink and the elevation gave us great views down into the church below. 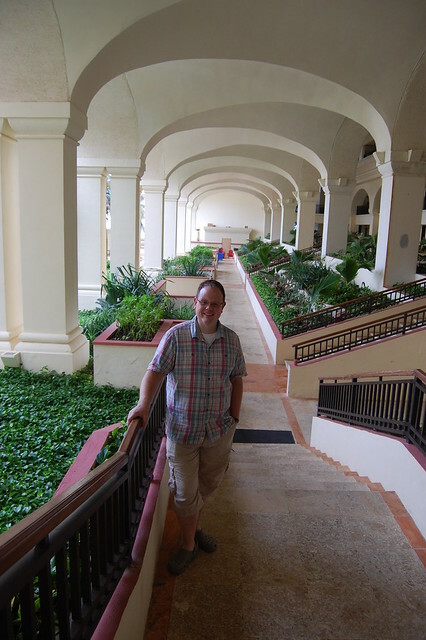 In the garden area of the church, we wandered through a botanical garden filled with exotic plants including bananas. 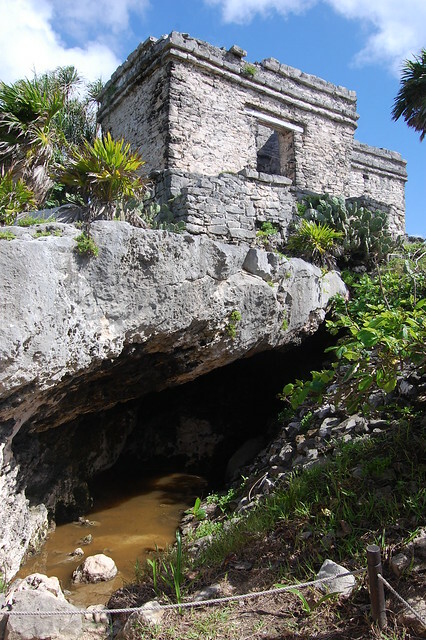 Most interesting, however, was the stone structure built above a cenote which had housed a water wheel dating from the early 1600s. Unfortunately the wheel was not present but we could look down into the well that it once spun around in. As we learned from a small museum exhibition, investigations into this well and the cenote that fed it had revealed lots of weapons. These dated from the Caste War which was an episode in history I had never heard of before. 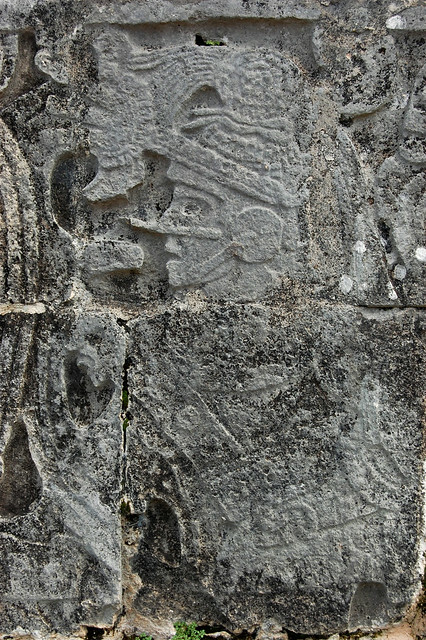 It was a conflict that arose between the indigenous Mayan population and the descendants of the European colonists in the second half of the 19th Century. 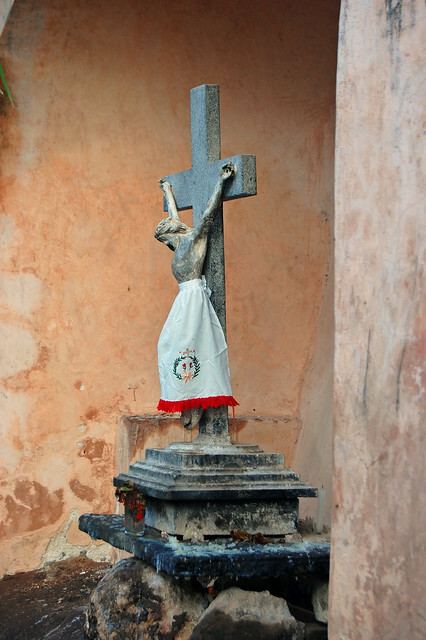 It made me realise again how little I knew about Mexican history. Valladolid itself was a bit of an odd town. It was a warren of streets seemingly all named just “Calle” and a number, a not quite grid system. We found ourselves a little lost in the maze when trying to exit the centre but that gave us the opportunity to see more of the town than we would otherwise have done. Some of the streets were really run down with ramshackle houses while others looked beautiful and were very well maintained. It was quaint but battered. That was its charm. Darkness fell quickly as we were driving back towards Cancun with literally no source of light, neither electrical road lighting or light from the moon since the dense foliage was obscuring it. With even less to look at than the morning’s journey to Chichen Itza, it felt like an even longer journey. We were exhausted after the long return trip so we ate in a Thai restaurant that forms part of the hotel complex and where we received a considerable discount. I had Tum Tang, a salad of marinated cucumber carpaccio, radish, ground peanuts, edible flowers, and tamarind sauce followed by green curry chicken. Mr Pict had Nua Dad Diew, strips of fried beef, to start followed by some sort of pork rice stir fry. On each morning of our vacation, we breakfasted in our hotel. It was included in the room price but also made sense in terms of logistics in time, allowing us to just munch and go. Hotel breakfasts can often be a bit limp, especially for me given that I don’t eat red meat, but this breakfast was incredible. It was a buffet of Mexican and European foods, patisserie, an omelette station, a wide variety of fresh fruits and even some Japanese food. When I am often stuck just eating scrambled egg on toast, there was a cornucopia of vegetarian food for me to sample and devour. Even the scrambled eggs were superb, creamy and light. The refried beans were the best I have ever had. Mr Pict was also delighted to discover that the sausages being served were just like British bangers. The waiter service was always superb. Indeed the waiters were like ninjas, bringing glasses of fresh orange juice before I even knew I needed another, replacing clean cutlery in the blink of an eye. On a practical rather than gastronomic level, the benefit of having feasted on such a wonderful breakfast was that we never needed to eat again – not even a snack – until late evening and that meant we never had to factor in meal times when we went out on excursions. 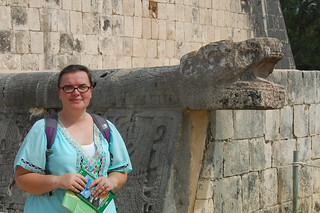 The destination for our first full day in Yucatan was Chichen Itza. We hopped in the car, headed onto the toll road, and in no time at all we had left buildings behind and were flanked by lush, verdant jungle on both sides of the road. With nothing but foliage to view over such a long distance, I cannot say it was the most exciting journey I have ever undertaken. There was very little to see between Cancun and Chichen Itza. Indeed signs warned that there was over a hundred kilometres to the next petrol station and exits were few and far between. One thing we did note were dozens of men scattered along the road who were pedalling bikes with large baskets on the front, somewhat reminiscent of butcher’s boys. We could not figure out where they were coming from or going to and many of them were even cycling in the wrong direction on the road. We did spot a serried row of riderless bicycles at one point, their baskets filled with wood. We assumed, therefore, that the men were pedalling hither and yon in order to gather the wood and that the collected piles of woods were then awaiting collection by motorised vehicle. I am not sure how many UNESCO World Heritage sites I have been to (certainly not enough!) 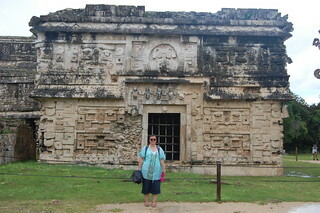 but I was very excited to be adding to my “collection” by visiting Chichen Itza. 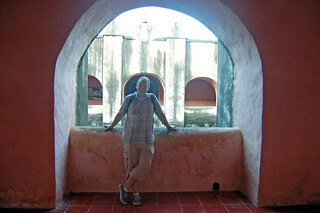 Mr Pict had been a quarter of a century before and found the place transformed, with the ruins now much more protected from the thousands of daily visitors and with much improved facilities. 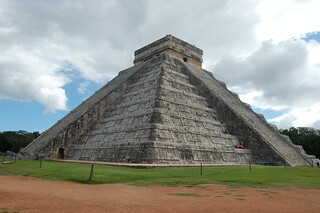 Chichen Itza is the area’s most famous and perhaps even Mexico’s most famous Mayan archaeological site. It dates from 600-1200 AD so is quite late as prehispanic settlements go. Indeed, people were still living there when the Spanish arrived. It was also apparently a culturally diverse city which accounts for its range of architectural styles. 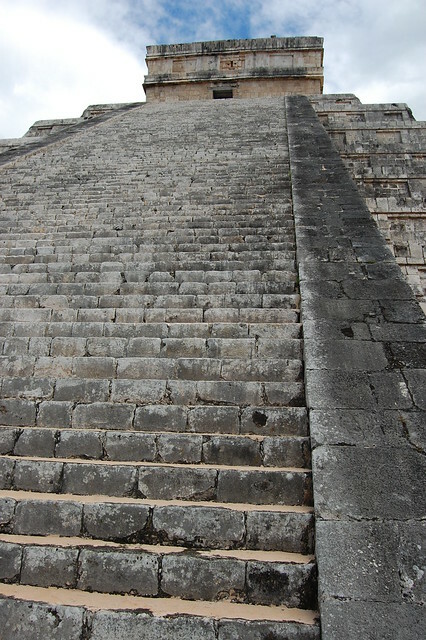 Tickets purchased, we stepped through the turnstile, took a few steps along the path and I was instantly wowed: my first view was of the massive 98 feet high El Castillo pyramid which actually dominates just about every view in Chichen Itza. 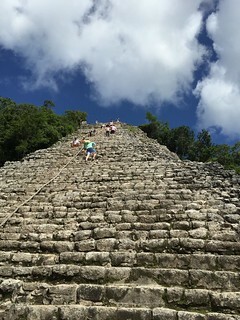 Mr Pict had climbed the pyramid – back in the day when preservation was apparently less of a concern – and I was rather glad that ascending and descending the steep steps was no longer permitted not only from a conservation perspective but also because I would have had a panic attack part way up. Even standing at the bottom of the steps and looking upwards made me feel a little wobbly. Those Mayans must have been hardy folk to not have suffered jelly knees. 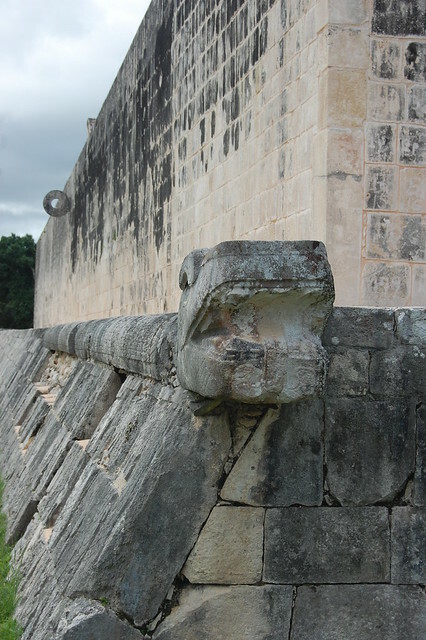 The temple being dedicated to the plumed serpent god Kukulkan, the steep stairs had pairs of feathered snakes at their bases. Apparently when the sun hits the stairs at certain angles, the serpentine effect becomes emphatic. Maybe those served as a warning that danger awaited anyone who even thought about rushing up and down those stairs. 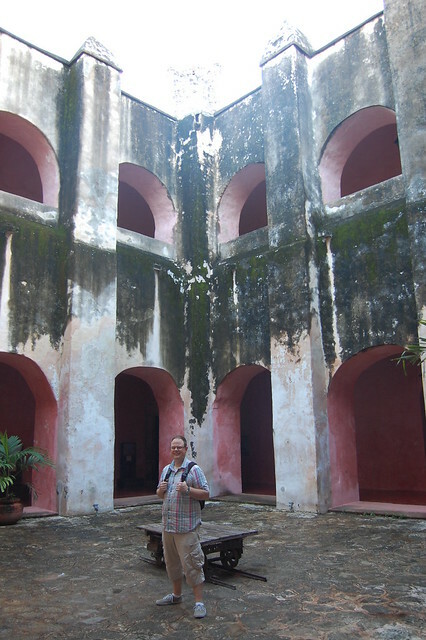 We started with the ball court which was one of my absolute highlights of the day. 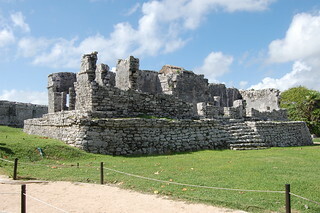 It is one of at least a dozen ball courts on the site but is by far the best preserved and is indeed the largest Mayan ball court in existence. Before seeing it for myself, I had not appreciated the vast scale of the Chichen Itza ball court nor how high the goal rings are. An interpretive board explained that it was unlikely that the tradition goal scoring rules of hitting the ball with the hip were followed at Chichen Itza because of the height of the rings but I have no idea how they managed since they struck me as being even rather high for basketball style hoop shooting. There are temples at either end of the huge ball court but it was the court walls that were the most fascinating and engaging. The carvings were hugely impressive, retaining such crisp detail after millennia exposed to the elements. 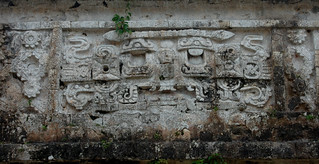 There were friezes depicting male figures, their costumes and expressions vivid in the stone, and a border of a scaled snakes body concluding in a large head. My favourite carving depicted a ball player being decapitated, the spurting blood transformed into undulating snakes. It was the winners who were sacrificed, it being some sort of honour to be chosen to appease the gods. Since I was always very rubbish at sport, at least I would have been safer as a Mayan. Chubby and unhealthy maybe but a least with my head attached. I was also rather taken with a stone platform that had edges carved in row upon row of skulls – sometimes referred to as a tzompantli. There was some speculation that it might have been connected to human sacrifice – I overheard one guide saying that it was probable and another saying that it was highly unlikely – but given the carvings in the ball court I think it was rather more likely that the former was true and that human heads were displayed on the platform. There was also a smaller pyramid or temple that had carvings of pumas on its four sides. I found those carvings to be rather delightful as there was something of the pose of a domestic cat in the angle of the shoulders and the tilt of the head of the large cat. Of course, this moggy was munching on a human heart which most pets don’t do. 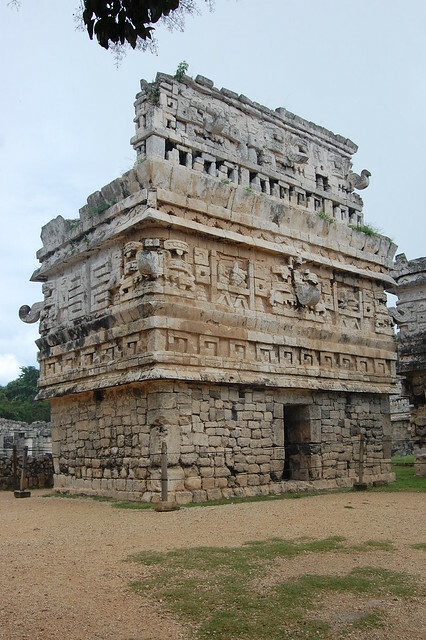 Apart from the ball court, my favourite buildings in Chichen Itza were the group known as La Iglesia – the church – and Las Monjas – or nunnery. They were off the beaten track a bit and were, therefore, more closely surrounded by trees and plants. What made them especially spectacular, however, were the amazing carvings: hieroglyphs, geometric shapes, long-nosed gargoyles, and gods. 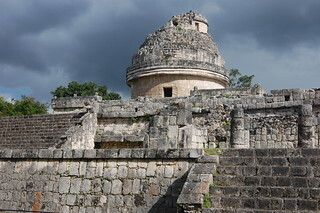 I also liked the El Caracol, known as the observatory. It contains a spiral staircase, which gives it its name, and is topped by a dome at the top that did indeed make it very reminiscent of modern observatories. 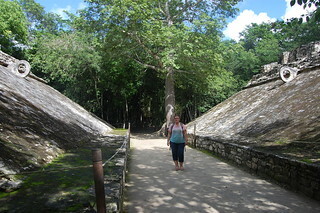 Annoyingly the path that leads out to old Chichen was blocked off to visitors on the day of our visit. That was a pity since the names of the buildings – involving as they did phalluses, turtles and monkeys – made that site a very intriguing prospect. The paths that circled the central “plaza” at Chichen Itza were lined with local people selling crafts and souvenirs. On the walk out to the Sacred Cenote – where the community had made sacrifices during droughts – we were able to see quite a few of the men sitting carving the wood and women sitting in the shade of trees sewing fine stitches into fabric. So omnipresent were the stalls, however, that the soundtrack to our visit to Chichen Itza became the promotional cries of the stallholders and the ever present growl of puma ocarinas they were selling all layered on top of the weird laser noise of tour guides relentlessly clapping to demonstrate the site’s weird acoustics. 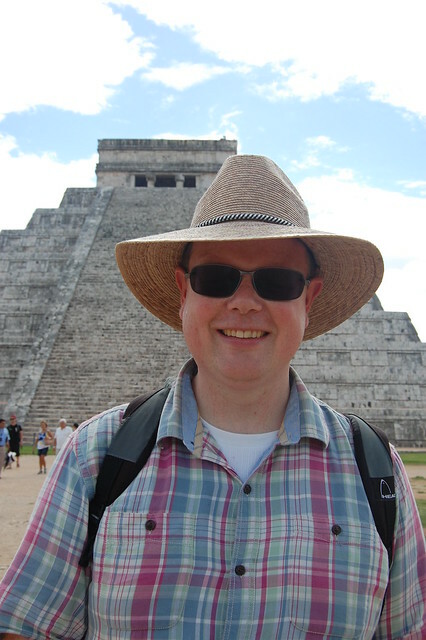 We absolutely loved our visit to Chichen Itza. 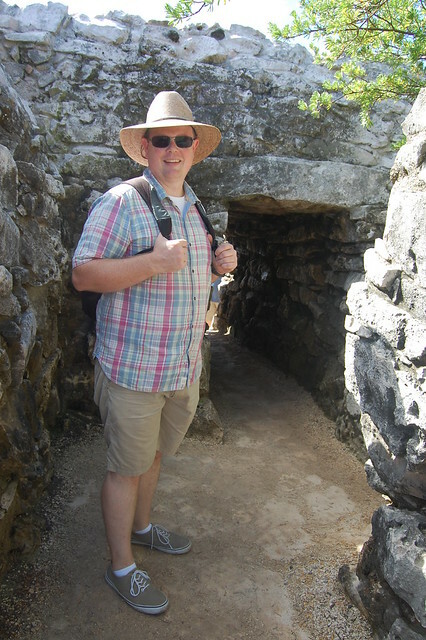 It was an incredible place full of fascinating archaeology and architecture, wonderful carvings, and intriguing details, and the visit left me itching to learn more about the ancient Mayans and what everyday life was like for them. 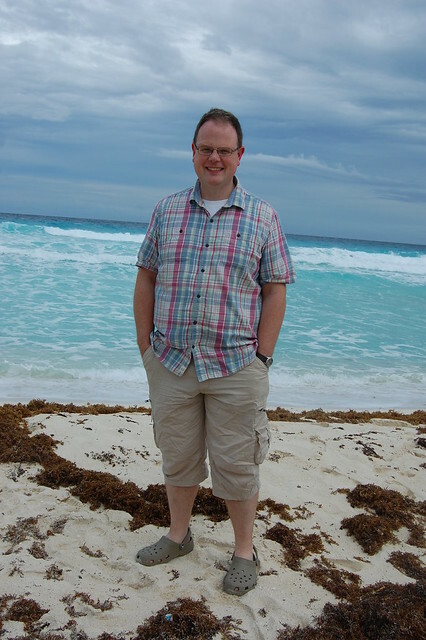 My husband surprised me on my 40th birthday by announcing that his gift to me was a vacation in Yucatan, Mexico. I was shocked into stupification. As the Pict family’s resident control freak, I am the one who plans all of our vacations and here I was going on a trip having had no hand in planning it, no clue it was even happening. It honestly took me quite some time to absorb the fact that this was really happening. 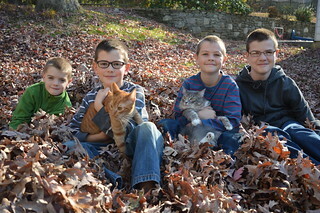 My in-laws, freshly arrived from England, were going to be looking after our four boys while we were away. Therefore, the vacation presented us with a welcome opportunity to spend quality time together as a couple rather than as parents and to decompress, relax, have fun, and explore. Furthermore, I had never been to Mexico before so I was getting to add a new country to my list. We flew out from Philly very early in the morning. Despite not being able to do online check-in because of my status as a Permanent Resident, we were able to check in quickly and everything else went smoothly too. In fact, the only drawbacks to the flight were that the man behind us was earthquake level snoring throughout and someone was producing noxious methane from their nether regions. We didn’t even have to share our seating row with a random since the aeroplane was half empty. 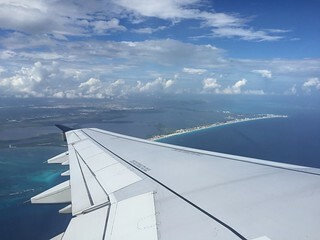 The early start meant that we arrived in Cancun in the afternoon, effectively gaining an additional day of vacation, especially since our suitcase was waiting for us in baggage claim. Our first stop was to take a shuttle bus out to the rental car area to pick up our car for the week. Car rental in Mexico is incredibly cheap, a complete bargain, and it gave us the freedom to get out and explore without having to conform to any sort of schedule or have any spontaneity inhibited. The car we were allocated was a Dodge Attitude and it more than earned its name. The car really had a bad attitude: it did the vehicular equivalent of having an asthma attack every time it accelerated and it had less oomph than a tortoise hauling an HGV by a rope grasped in its maw. Still, it got us from A to B reliably and was easy to park up even in tight spaces so we had no real complaints with its performance. It even managed to handle all of the topes. Topes are speed bumps (sleeping policemen to we Brits) and they appear not just in residential areas and town centres but also on main roads. They are not often visually obvious as part of the road surface and some of them are quite steep. One has to be vigilant, therefore, in looking for the road signs indicating that there are topes around and it is also necessary to approach them at little over a crawl, which can be quite tricky when driving on a faster main road: Mr Pict missed spotting one was ahead and went over it too fast and almost had a Dukes of Hazzard moment. In no time at all we were checking into our hotel, the Marriot owned CasaMagna. It was a lovely hotel, much more luxurious than anywhere I have stayed before. Mr Pict and I normally treat hotels and motels as somewhere to lay our weary bones after a day of travelling but he chose the CasaMagna on the basis that he wanted us to have some time just chilling out around the hotel. He chose wisely as the hotel was superb not just in terms of the fixtures and fittings and the resources but also in terms of the friendly staff who got every detail spot on. Someone even came in each evening to turn our bed linen down for us. We were treated wonderfully throughout our stay. Our room was on the top floor with a great sea view from the balcony, a sofa area, a squishy king size bed, and a swish bathroom. 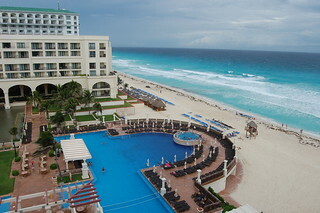 We quickly unpacked our suitcase and then headed down through the hotel’s open air corridors and out onto the beach. It was lovely to walk along a beach in mid-November and feel toasty warm. 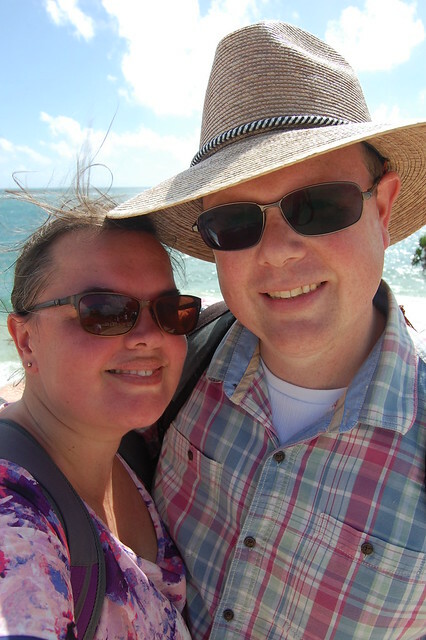 It was also wonderful to walk along a beach and not have to keep my eyes skimming and scanning for four children. 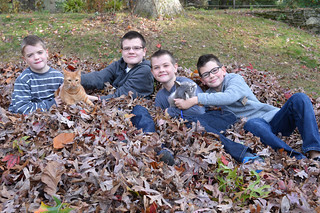 Our youngest son got lost on a beach for 15 minutes a few years ago – and 15 minutes felt like so much longer – so I have not been able to truly relax on a beach with the kids since. Kid-free, I could actually just enjoy the warm air, the sea breeze, and the turquoise water lapping around my feet. I loathe sand generally – the only good sand being glass – but must admit that as far as sand goes that beach was pretty tip top. We then parked ourselves on a pair of sun loungers to do some people watching, including a bloke who was kite surfing quite dramatically. After giving ourselves a quick spit and polish after getting a tad soggy on the shore, we headed out to dinner. We chose a restaurant called La Habichuela Sunset further up the beach strip in Cancun. It not only had a good write up in guides we had read but also served both traditional Yucatecan and prehispanic Mayan dishes. The restaurant looked totally unassuming from the exterior but it definitely had the wow factor inside. A staircase with a balustrade carved as snakes with open, sharp-toothed mouths ended on a last step landing on a glass floor showing some ancient stone steps beneath. Though I knew it was safe to stand on, I found myself edging around it until I could get my feet back on the solid floor. I felt a bit silly until I noticed almost all of the other diners also avoided placing both feet on the glass. 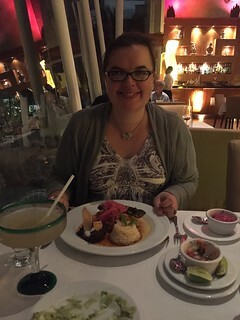 There were replica Mayan carvings and statues around the walls, with colour changing lights poised on them, fancy light fittings, and we were seated at table next to glass wall overlooking a pretty garden dining area with stone columns echoing Mayan ruins. We had a pair of great waiters named Juan and Miguel whose service was faultless throughout. The food was spectacular too, a whole explosion of flavours, tangs and textures. I had chicken lime soup to start and Mr Pict had a deliciously creamy but chunky guacamole served with a piquant salsa and crunchy tortilla chips. My entree was a Mayan dish called Chicken Pibil, which is seasoned with achiote and then cooked inside a wrapping of banana leaves. It was scrumptious. Mr Pict had Chicken Mole and declared the sauce of peppers and chocolate to be richly delicious. Dessert was a light and flavourful coconut cake for me and a parfait within Kahlua for Mr Pict. 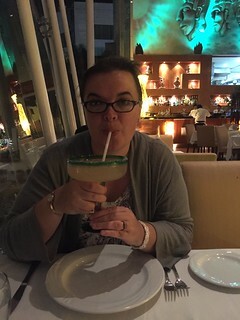 We both had margaritas and perhaps the context helped but I think it might just be the best margarita I’ve ever had. Completely stuffed, we decided to have a drive around the area to get a glimpse of the nightlife. There were lots of brash hotels and clubs but also strips of derelict buildings. There was certainly nothing that compelled us to park the car and get out for a wander. We headed back to the hotel to read on our balcony and relax ahead of a big trip the next day.